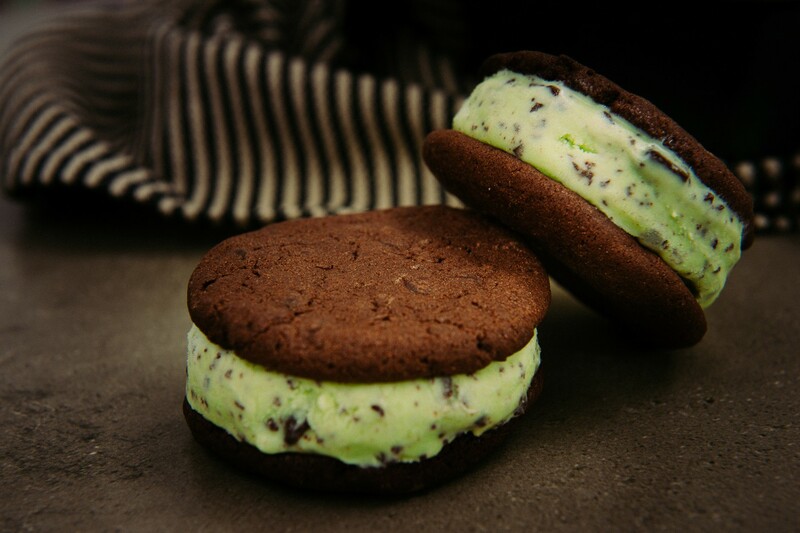 It’s hard not to feel like a little kid when you have a mouth full off chocolate cookie and minty-green ice cream dripping down your fingers! 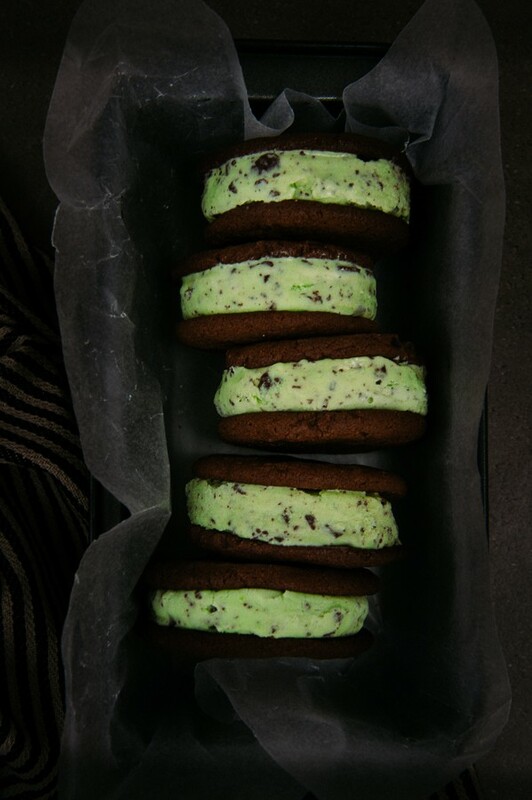 These chocolate mint chip ice cream sandwiches are fabulous for entertaining as you can prepare the cookies and ice cream well in advance, and just assemble them when it’s time to serve. Now of course you could fill your cookies with shop-bought vanilla ice cream – *boring*. I highly recommend you mix up some Mint Chocolate-Chip Ice Cream instead*. Your guests will be wowed by the interesting flavour and the minty colour is right on trend too! There are two important factors in make a winning ice cream sandwich. Firstly the texture of the cookie is important as you don’t want the sandwich to fall apart after one bite. Ideally you want a cookie that is not too soft, nor too crispy. Double Chocolate Brookies are perfect for the job. And they will keep in an airtight container for up to 5 days. Secondly your ice cream needs to be firm when you assemble the sandwiches. If the ice cream is too soft, you’ll end up with a melted mess before you’ve had one bite. So instead of allowing the ice cream to soften and then spreading it on the cookies, do this: after churning your ice cream, spread it into a baking tin to a thickness of about 2cm. Smooth the top, then freeze. Once it is frozen, use a cookie cutter or large glass to cut out discs of ice cream about the same size as your cookies. Place these discs on a tray and freeze again until it’s time to serve. Not only will this save you time when assembling the sandwiches but they’ll also look beautifully neat!